My daughter’s school has a pretty strict policy about enforcing outdoor recess each day, even if it’s only for a short period of time. We live in Toronto, Canada, which can make this pretty tricky, but unless it’s pouring with rain or there’s a windchill warning in effect, the kids will spend a portion of their day letting off some steam on the playground. It’s not only important for the well-being of the students, but for the staff as well, and on the days the kids are stuck inside, I definitely notice a difference in everyone’s mood and temperament! 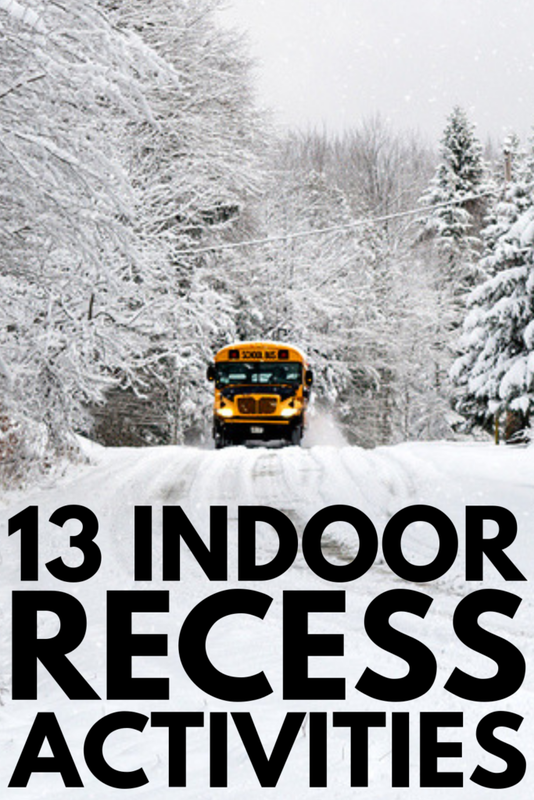 Recess is such an important part of the school day for so many reasons, and if you’re looking for indoor recess activities to help keep your students moving when the weather forces you to stay inside, we’ve got 13 super fun ideas you’ll love. Why is Recess Important for Kids? Improves academic performance. Providing children with regular breaks throughout the school day not only helps them shed excess energy so they are better able to sit still and focus, but it also helps them retain the information they’re learning. Helps build social skills. Engaging in unstructured play helps kids learn how to socialize with their peers, and teaches them important problem-solving and negotiation skills as they navigate conflicts on the playground. Improves behavior. When children have an opportunity to let off steam throughout the school day, it can have positive benefits on their behavior. This is especially true for children with ADD and ADHD. Encourages physical activity. We live in a time where children are more sedentary than ever thanks to tablets and smartphones, and recess provides the perfect opportunity to get kids active while also helping them work on their gross motor skills. Improves mood and reduces stress. It’s no secret that exposure to Vitamin D has positive impacts on our mood, but even when the weather won’t allow children to get outside, getting them out of their seats, encouraging them to interact with their friends, and finding ways to keep them active can have huge benefits on their mood and stress levels. The types of indoor recess activities you choose will obviously depend on the age of the kids in your classroom, as well as the amount of space you have to work with. I’ve included ideas for cramped spaces, as well as options you can try if you can spend time in the hallway or in the school gym on bad weather days. Number each corner of the classroom with a 1, 2, 3, or 4 and choose a student to be ‘IT’. This person must stand in the middle of the room, close their eyes, and count to 10 while everyone else in the room chooses one corner of the room to run to. The person who is ‘IT’ calls out a number (1, 2, 3, or 4) and everyone who is in that numbered corner is out. The game continues until only one person is left, and then that person becomes ‘IT’ for the next round. Kids love this game, and it’s a great way to help kids shed excess energy when you’re in need of indoor recess activities on bad weather days! Have each student stand at their desks or ask them to gather in an area where there is more room for them to move around, and then lead them through different gross motor movements: ‘Simon says stand on one leg’, ‘Simon says do 3 jumping jacks’, ‘Simon says hop like a bunny’, etc. At some point throughout the game, provide a command without saying ‘Simon says’ first, and whomever completes the movement is out. Continue playing until you have a winner, and then appoint that person to become ‘Simon’. This classic party game offers a brilliant way to get kids moving and laughing, making it one of many fabulous indoor recess activities to consider! 4) Fun with masking tape. There are so many fun activities for kids you can create with nothing other than a roll of masking tape. You can create a game of indoor hopscotch or tic-tac-toe, or you can devise an obstacle course of straight and zig zag lines your students have to complete by crawling, jumping, walking backwards, and/or while holding something heavy. 5) Have a dance party. A great impromptu way to help your students burn off energy when you’re stuck inside is to play some music and have a dance party. This is a great way to help children get their wiggles out to help promote focus, and it also helps reset everyone’s mood. If you’re looking for indoor recess activities and have a little extra room for kids to move around, like a hallway or the school gym, consider setting up some fun party games, like egg races (we love this egg race play set)! Start with a simple race across a room or hallway, and then make the game more difficult by asking them to switch between their right and left hands, walk sideways, walk backwards, etc. Blow up a few balloons and let your students hit them across the room, or take it a step further by setting up a game of indoor balloon volleyball. You can also grab a couple of rackets (or fly swatters if you’re working with a tight space) and organize a game of indoor balloon tennis. The possibilities really are endless! Choose 7 students to come to the front of the room, and have the rest of the students sit at their desks with their heads down and one thumb raised in the air. Next, ask each of the 7 students to tap one student on the back (or thumb) before returning to the front of the room and then say, ‘HEADS UP, 7-UP!’. Each student who was tapped must stand up and has one chance to guess who tapped them. If they guess correctly, they swap places. If they don’t, they sit down. Write a bunch of different animals on different pieces of paper, throw them into a hat, have each student choose one, and then have him or her walk across the classroom while pretending to walk like the chosen animal and see how long it takes the rest of the students to figure out what the animal is. 10) Jumping jacks / jogging in place. Set a timer and see who can do the most jumping jacks and/or jog in place the longest without stopping. Leg lifts are a great classroom exercise for restless kids! Have each child stand sideways behind a chair and, using the chair for support, have them lift their legs up with their knees at a 90-degree angle. Try varying the length of time it takes them to raise and lower their legs (5 counts up, 5 counts down), and then see if they can balance for a count of 10 without holding onto the chair. Hula hooping is one of my favorite indoor recess activities, especially since you can get the whole classroom involved if you have enough space. Challenge one another to see who can keep their hula hoop in motion the longest, and if you have several hula hoops, you can use them to setup obstacle courses. While you definitely want to find indoor recess activities that encourage kids to get out of their seats and remain active as long as possible, sometimes that’s just not realistic. The good news is that there are a lot of fun board games that will still create excitement, which you can setup at different stations within the classroom for your students to play together to promote socialization. Here are some options to consider! Learning Resources Lil’ Lemonade Stand-Off. I’ve never met a Learning Resources game or toy that has disappointed me throughout my career as a mom, and this game is no exception. It’s a memory building game designed for kids aged 5 and older, and while the premise of the game is simple enough for kids to grasp and play without adult supervision, the cards can be quite challenging! Operation. This is a great game to help kids work on their fine motor skills! Players take turns removing wacky ailments from the game board using a set of tweezers, and have to be careful to remove each piece with precision so as not to set off the buzzer. This is an oldie but goodie your students will love! Scrabble. Scrabble is a great game for kids who struggle with planning and organization. As the game progresses, they must strategize and anticipate how they can build their own words off of those already played by others. This is also a great game for kids who struggle with spelling and/or vocabulary, making it another one of my favorite indoor recess activities! HedBanz. If you’ve never played HedBanz, you’re in for a REAL treat. Not only is this game fun, the question and answer premise behind this game will also challenge your student’s critical thinking and deductive reasoning skills. This is definitely high on my list of indoor recess activities to consider! Stare! Junior. This game will challenge your students’ memory, concentration, and imagination all at the same time. Players are given 30 seconds to stare at an image on a card, and then the card is flipped over and another player asks them a series of questions about the image to see how much they can remember. It’s heaps of fun! I hope this collection of indoor recess activities inspires you to find ways to get your students up and moving on the days the weather forces you to stay inside. As tempting as it may be to setup quiet activities when you’re stuck indoors, it’s important to find ways for children to blow off steam and socialize with their friends to ensure they can focus and concentrate on their lessons for the remainder of the day. And since regular brain breaks help improve everyone’s mood and behavior, 30 minutes of loud, chaotic play in the classroom may be more beneficial than you think! If you found this collection of indoor recess activities helpful, please share this post on Pinterest!